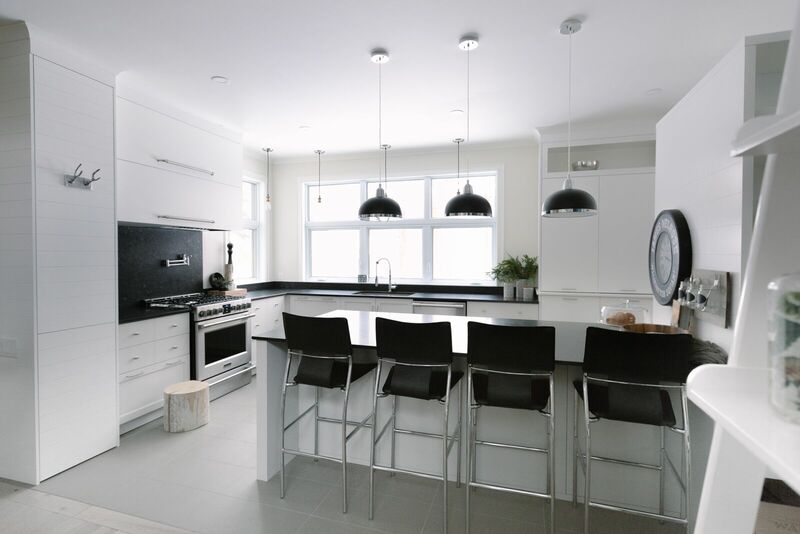 Jonathan Simard and Jessica Rhaids knew even before they started designing their new kitchen that they were going to use Saint Henry Black Granite. Jessica wanted uniform granite and Jonathon was going for a masculine look – timeless and solid. With black textured graining, Saint Henry was the best choice. 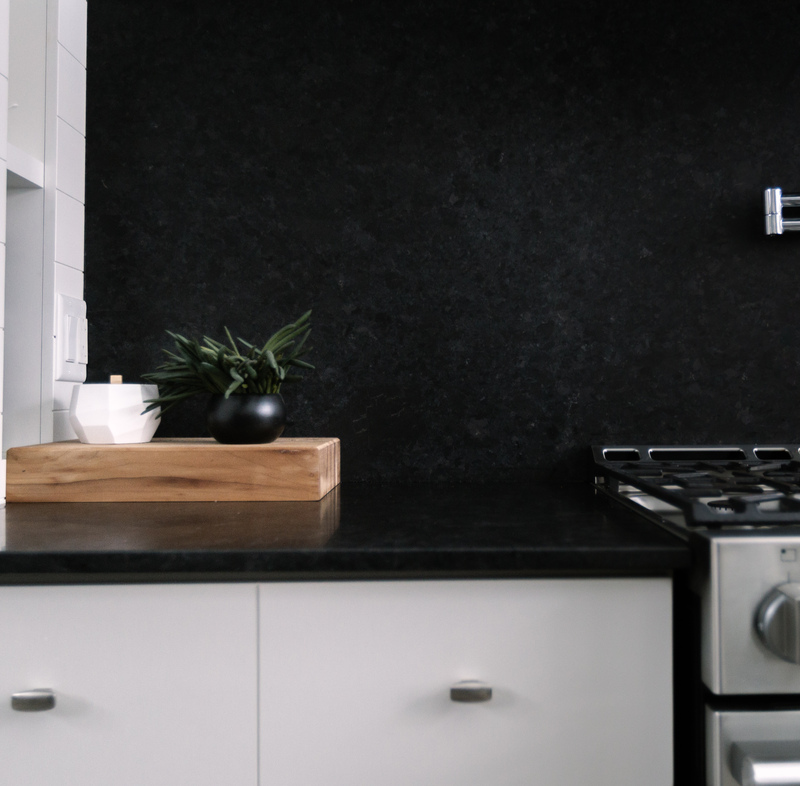 Saint Henry Black Granite is also known as Taillon and Canadian Black. The smooth crystalline composition of this granite features thin silvery veins exposed by black textured graining. With Cas par Cas cabinets, fabrication by Ciot, and Jessica as the architect/designer on the project, there was no doubt this kitchen would look flawless. What distinguishes Cas par Cas from other companies in this industry is their integrated furniture – kitchen and bathroom cabinets built in their own shop. Jonathan and Jessica chose white cabinets to go with the Saint Henry Black Granite for a classic black and white kitchen. There is such a welcoming vibe when you enter Jonathan and Jessica’s home. Dubbed the family resort, their house is always open for friends and family to join them, along with their 2 young children. Guests feel comfortable because they aren’t afraid of breaking something or staining the countertops. 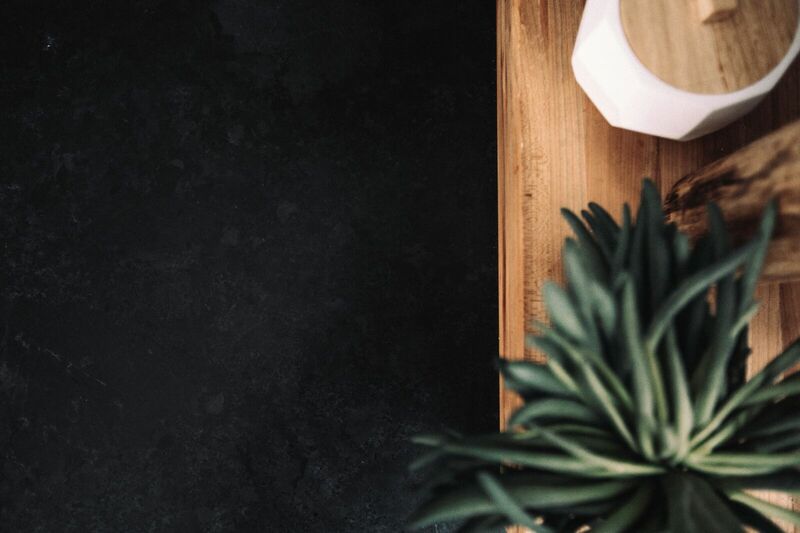 Curious about his love affair with Saint Henry Black Granite, we asked Jonathan to tell us all about his kitchen design and the inspiration behind it. THIS SPACE HAS A BEAUTIFUL, CRISP BLACK AND WHITE PALETTE. WHAT WAS THE INSPIRATION? We were going for the look of a classic, New England style beach house like you see in Cape Cod and the Hamptons. CAN YOU TELL US ABOUT YOUR KITCHEN DESIGN? It’s an open-concept kitchen with a classic and timeless style using natural material. We have 2 cm honed Saint Henry Black Granite countertops and a 4x8 kitchen island with 4 stools. The countertop near the inlaid sink is 12’ and the countertop near the oven is 8’. The floor is taupe ceramic and the wall paneling is lacquered cherry wood. The LED color changing lights make the kitchen very bright. 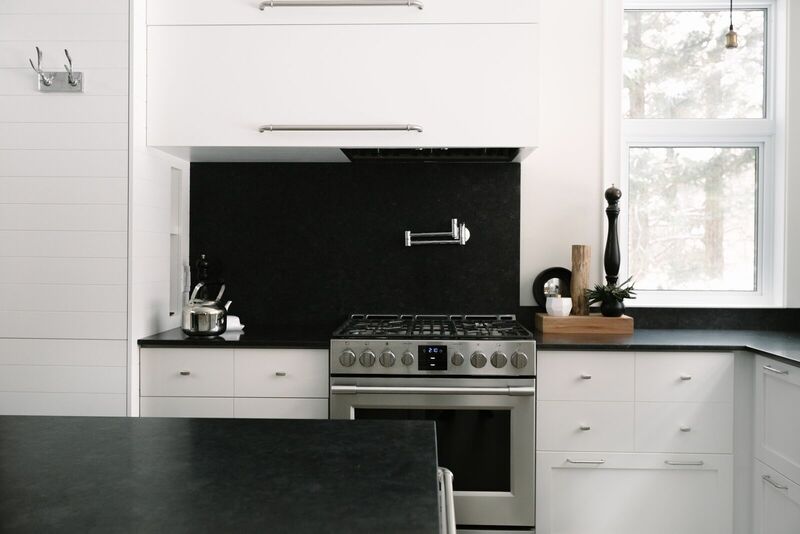 Is THE BRIGHTNESS OF YOUR KITCHEN WHY YOU CHOSE BLACK GRANITE? The choice would have been the same either way because we love this granite, but we also like how the white lacquered cherry wood cabinets highlight the black granite. We chose the countertop first and then designed the rest of the kitchen. The Saint Henry Black Granite was basically the basis of the design. There are more well known black GRANITEs. what drew you to this one? We liked the look of the uniform black granite, and this one was recommended by a friend. It also has a sort of sentimental value because my mother is from the same location as the stone. We knew even before we started designing the kitchen that we were going to use this granite – that’s how in love we were with the material. Tell Us about the finish and the backsplash. We chose honed which is a different finish than we normally use. We're happy with it because it's very easy to clean and doesn't show fingerprints. Maintence is very simple. They’re so easy to wash. For the backsplash we wanted to create a wow factor. 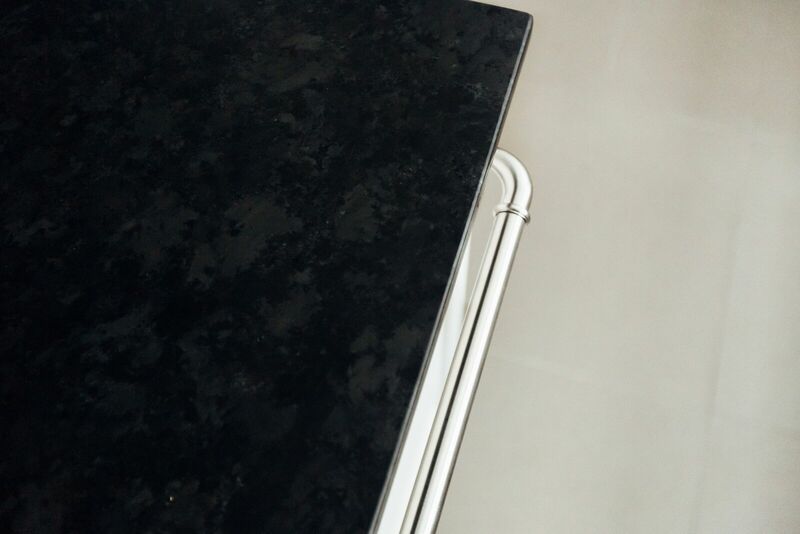 The chrome wall faucet above the oven and the black granite contrast nicely, giving the kitchen a classy look. Designing an entire kitchen around a countertop material makes sense aethetically and financially. Surface materials are one of the largest investments in any kitchen design, and the most long lasting. The durability of granite means these countertops will still be in great shape when Jessica and Jonathon welcome their grandkids to the kitchen. Design your next project around your dream stone. Download our natural stone mood boards.